With over 24 locations, blazing fast speeds, easy-to-use interface, and multiple clients, SaferVPN a great. However, the company retains IP logs, meaning your real IP is stored by the company, leading to this information being able to possibly identify you. Take me to the Official SaferVPN Website! SaferVPN is a smaller VPN company based out of Israel and has been providing VPN services for a little over a two years now. SaferVPN was originally a privately held VPN supplier and decided to turn their service commercial and to the public. SaferVPN’s pricing is a bit unique from other services providers. Instead of the company offering additional countries, longer plans or any extras, the company bases their prices off the number of devices you need connected at one time. If you’re using the VPN just on your personal computer, you can opt for the one device plan. But if you want to use this on your tablet and computer at the same time, you will need to bump to the next plan up. The pricing and packages are as seen below. The single device plan starts at $7.99 which is reasonable. To load up three connections under a single account, you’re going to have to bump the plan to $16.90 per month. Then if you want to be able to connect 7 devices at one time, the plan dives into a whopping $29.99 per month. The first tier price seem reasonable for the benefits, but anything exceeding past $10 per month is a bit to much. There are many high-quality services that offer an array of features, but no VPN can offer any additional features (aside from a wider country selection) worth more than $10.99 per month. Though, if you’re not happy for any reason with your subscription, you can get a money back guarantee after 15 days, risk free! Considering the VPN has a very friendly price point for one user, lets take a look at what features SaferVPN offers. The company advertises anonymity, security and simplicity, alongside an array of servers scattered throughout 24 different countries. Including locations in New York, Los Angeles, Australia, Finland, Sweden, Switzerland, Italy, India, United Kingdom, Germany, Hong Kong, Canada, Spain, Holland, Japan, Russia, Brazil, Denmark, France, Austria, Israel, Poland, Norway. SaferVPN also notes that the service comes with clients compatible with Windows, Mac OS X, iOS and Android. The company also supports Tomato and DD-WRT, meaning you can run this VPN atop your router for maximum privacy. The rest of the features advertised are general security, protect your identity, anonymize browsing and noting the connection is encrypted. Now when it comes to a VPN, we are all looking for top-of-the-line security. One of the main benefits from a VPN is security, meaning your connection is encrypted with strong protocols to secure your connection. Stopping hackers, data theft, snoops and giving you the ability to evade firewalls. 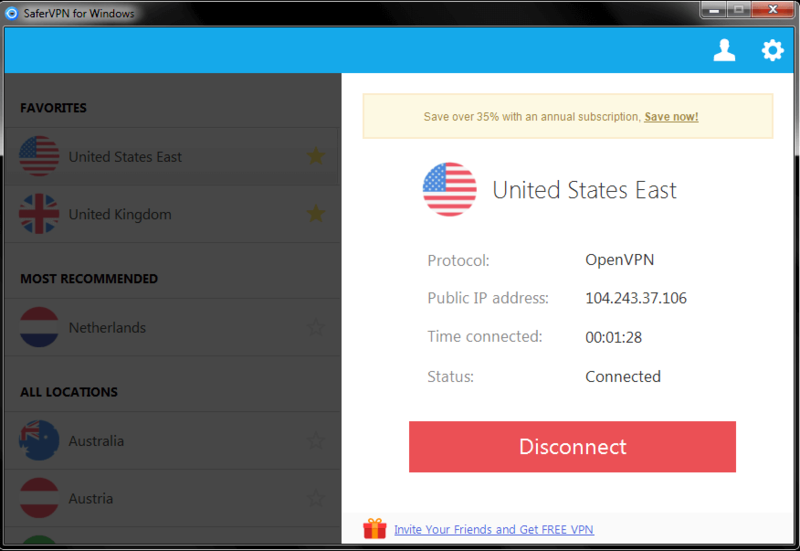 SaferVPN advertises they support OpenVPN, L2TP, PPTP and their own proprietary protocols. As L2TP and PPTP are irrelevant and insecure, we did all of our SaferVPN review through the OpenVPN protocol. It is the safest and fastest protocol on the market that we have access to today. What we found troubling was their a lack of documentation regarding the encryption. The company only noted what VPN protocols the service offers, but not what encryption protocols the service uses to secure your communication. The only information found, said SaferVPN uses 2048-bit encryption, but that doesn’t state on what. The lack of protocols mentioned makes us weary of what the service may be using and if the protocols are up-to-date and secure. We believe no logs should be kept by any VPN provider, especially if it’s related to customers. Nearly all the collected data could be personally identifying. Though SaferVPN does not log traffic or spy on users we still strongly disagree with their logging policy. The logging policy alone turned us away from the VPN, but if privacy is not of upmost importance, SaferVPN is still a great choice. Please watch our SaferVPN Review YouTube video to watch us buy the service and set it up live on camera. That will give you an accurate representation of what you can expect right out of box from SaferVPN. Signing up for SaferVPN was a breeze. We chose the single package for $7.99. From there, we were redirected to a screen where we could choose a monthly or annual plan, an email and password for an account, and our payment options. 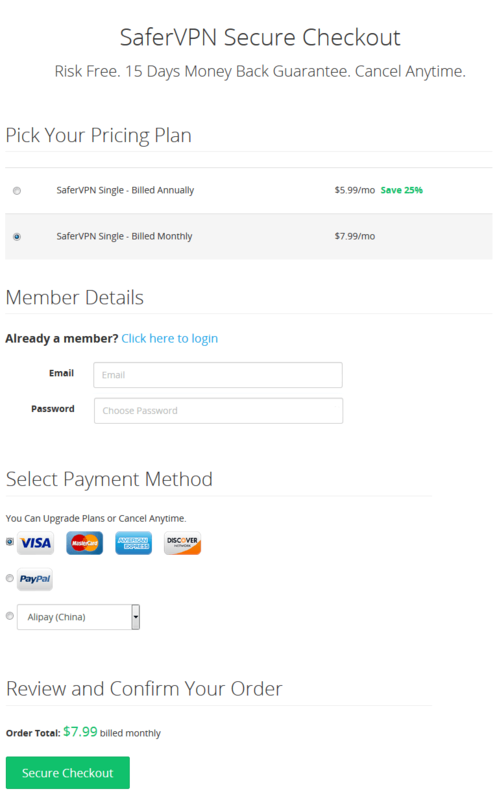 Currently SaferVPN allows you to pay with a credit card, PayPal, BitCoin, Skrill, online transfer, AliPay and Webmoney. Most importantly, the company accepts bitcoin, which is an anonymous cryptocurreny that allows for safe and secure payments without your identity being disclosed. After paying, we got directed to a download screen, where we chose our client, which is Windows, and installed their SaferVPN client onto our computer. The install was basic with no additional bloatware, it just required us to update to the latest TAP drivers, which the client did for us. The Windows client has to be one of the best features with SaferVPN. Their proprietary client allows you to switch VPN protocols and hop countries with just a few clicks. 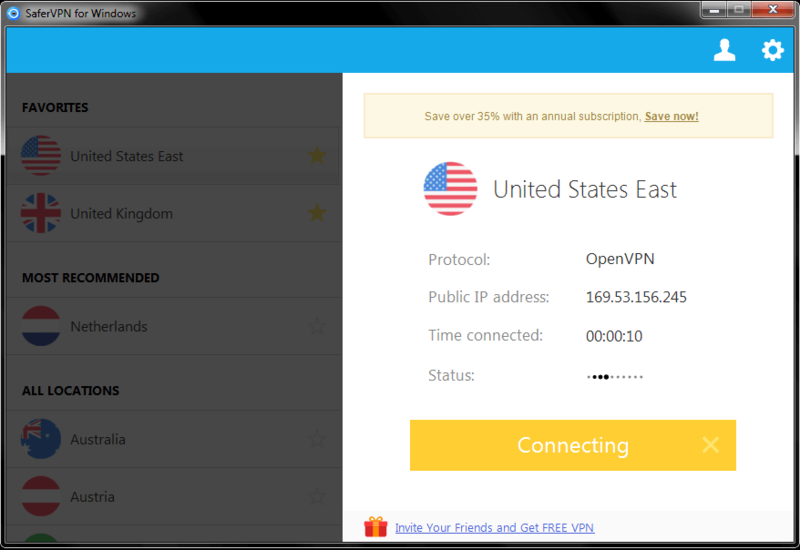 For example, you could be using OpenVPN on a United States server. Within a few seconds you can switch to L2TP in the United Kingdom. The client has great functionality and makes for extremely easy management. The client interface is clean and friendly. The sidebar has a list of all the countries and locations you can connect too. The star allows you to favorite countries, so your most preferred countries are at the top of the client list every time. Connecting is simple, click the connect button. It may take a few seconds but the VPN should establish a successful connection. SaferVPN Windows client should return a SaferVPN IP address in the public IP box, this will let you know your connection is secure and your IP address is being anonymized. SaferVPN offers installers for all of the following devices. On Mac OS X, the client looks similar, but instead of a full client, the VPN will appear as an application in the white bar atop the Apple logo. From there you can choose the desired location, connect and disconnect. For iOS, SaferVPN has a special panel that you visit on the devices. Once you visit the link on a device, you log into the website directly from the special link and continue to setup the VPN on your device. SaferVPN then allows you to connect to their list of countries. Android has it’s own dedicated SaferVPN application, the Android client just looks like a smaller version of the Windows client. Aside from everything being selected through panels, the Windows and Android client are near identical. SaferVPN offers additional support for DD-WRT, Tomato, Linux (Ubuntu), Chromebook, and the Windows Phone. Here are several different speedtest while using SaferVPN throughout the days. As you can see in the photos above, the speeds remain decently fast among the variety of servers. Through several days of testing SaferVPN, we found the service had great speeds across any number of servers. Throughout a variety of servers the speed remains fast, consistent and stable. Though we did find throughout peek hours of the day, while using large amounts of bandwidth, the VPN had trouble keeping up. This was only during extreme bandwidth sessions, while the VPN was under heavy usage during peek hours of the day. The speed problem saw itself out the door within only an hour or two. Overall SaferVPN had stellar speeds, even across their overseas servers! What is the security test? This is when we check the VPN security out of the box. Seeing if the service really protects our IP, protects our DNS queries and assures that all IP leakage is patched. Upon installing the VPN, we did the security test right out of the box on our SaferVPN video review which can be seen above. A few days later, we went ahead and did the same tests again, seeing if the VPN masks our IP, secures our DNS and patches IP leaks. 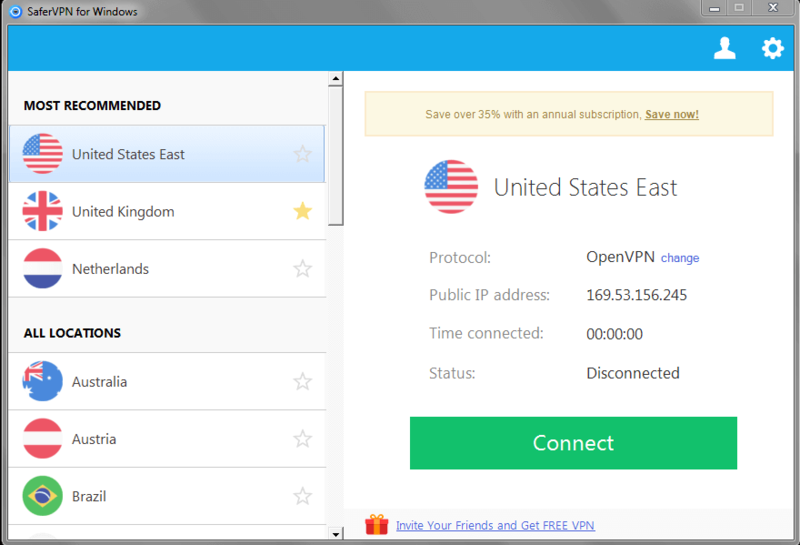 During this test, we were connected to the United States server on the SaferVPN Windows client using the OpenVPN protocol. To avoid clutter, we will not be posting pictures of the general IP test. The general IP test was succsful, masking out IP making us appear in New Jersey. The second test if our extended IP test. This test will will trigger software on the computer to load and see if the VPN is really securing the whole machine. Things like Java and Flash will be triggered, meaning the IP address the computer is broadcasting will appear. In our initial video review, the VPN failed to mask the IP when executing the WebRTC plugin. We found that a week later and multiple connections later the VPN does not secure the hole we initially experienced. Everything below except the time on the computer matched the details of the VPN which is common. 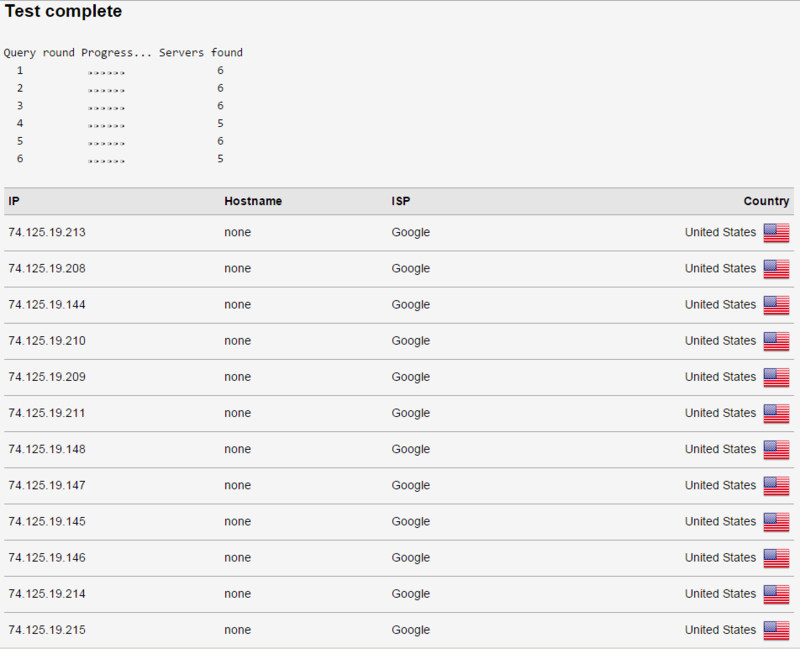 When testing the VPN we found SaferVPN routes all queries through Google DNS. 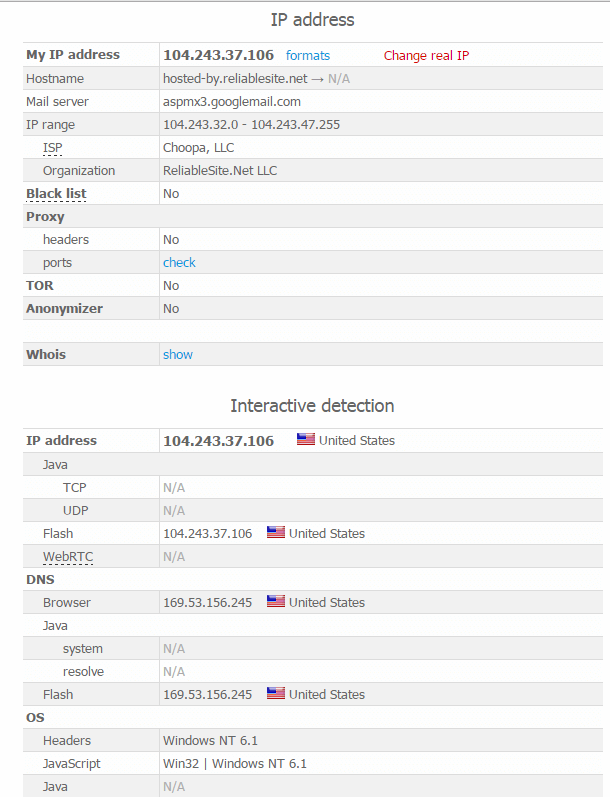 Though this is not necessarily bad, Google is a company that is known to invade privacy and has not deleted a single email or search query from their servers since 1995. We would have been much happier to see a custom secure DNS or a form of protection SaferVPN offers directly. Out of the box, SaferVPN does its job. Our IP address was masked, the DNS queries were not being sent to any unwanted third-parties and there were no form of IP leaks at all. SaferVPN does what it is advertised to do straight out of box. What are SaferVPN’s policies? What does SaferVPN let you do on their VPN? For starters, SaferVPN does retain minimal logs which includes your IP address, alongside the service does not support bittorrent on any of it’s servers. Though the service does retain possibly identifying information, SaferVPN operates out of the jurisdiction of the USA, meaning data is more likely to stay private as US officials can’t breach laws overseas. Though we don’t want to justify that keeping any type of logs as a VPN provider is okay, it may as well just be noted it’s not at risk to third-party governments. Aside from the service not supporting bittorent, we did not find anything else to be censored while using the provider. Our verdict on SaferVPN is the service is exceptional. With great speeds, a great Windows client and stellar website, the VPN overall is solid, but we still have privacy concerns. SaferVPN retaining IP logs could be particularly identifying, meaning the users may not be so anonymous. Additionally, the service blocks bitorrent. One key to a VPN provider is being able to do what you want with piece of mind. That does not mean having a VPN keep IP logs and tell you what you can and can’t do on their service. Additionally, the package deals can get pricy after one user. 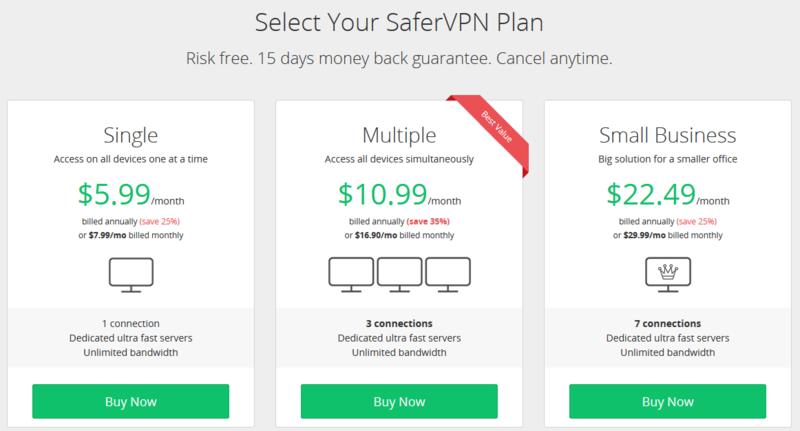 Many VPN providers offer 3-5 simulations connections in their cheapest package, but SaferVPN incorporates this into their pricing standpoint. Using anymore than one device at one time may drive the bill up a substantial amount. If you’re not in the market for high-end privacy, SaferVPN is a smart choice if your looking for an easy to use, fast, reliable and client packed VPN! Check out the official SaferVPN Website!